This is a very different notion of supply and demand from the one diagrammed in the introductory chapters of any economics textbook. The traditional supply and demand curve conveys a simple lesson: As a resource is consumed, it becomes more expensive to produce. For instance, as gold is mined, the easy (cheap) nuggets are found first; but to mine little particles of gold out of 25 tons of rock requires a higher gold price to make the effort worthwhile. Therefore, the supply curve slopes up, with the potential supply increasing as the price goes up. In contrast, the traditional understanding of demand says that demand slacks off the more supply there is. If you have lobster on Monday, Tuesday, and Wednesday, you'll be less interested in having it again and more inclined to pay less for lobster on Thursday. Therefore, the demand curve slopes down, with prices dropping as a product becomes abundant. In the new order, as the law of plentitude kicks in and the nearly free take over, both of these curves are turned upside down. Paul Krugman, an economist at MIT, says that you can reduce the entire idea of the network economy down to the observation that "in the Network Economy, supply curves slope down instead of up and demand curves slope up instead of down." The more a resource is used, the more demand there is for it. A similar inversion happens on the supply side. Because of compounded learning, the more we create something, the easier it becomes to create more of it. The classic textbook graph is inverted. ...and then fills it. This is a very different notion of supply and demand from the one diagrammed in the introductory chapters of any economics textbook. The traditional supply and demand curve conveys a simple lesson: As a resource is consumed, it becomes more expensive to produce. For instance, as gold is mined, the easy (cheap) nuggets are found first; but to mine little particles of gold out of 25 tons of rock requires a higher gold price to make the effort worthwhile. Therefore, the supply curve slopes up, with the potential supply increasing as the price goes up. In contrast, the traditional understanding of demand says that demand slacks off the more supply there is. If you have lobster on Monday, Tuesday, and Wednesday, you'll be less interested in having it again and more inclined to pay less for lobster on Thursday. Therefore, the demand curve slopes down, with prices dropping as a product becomes abundant. In textbook economics the supply of products would only increase if their price went up; in the new economics the supply increases as price goes down. In the new order, as the law of plentitude kicks in and the nearly free take over, both of these curves are turned upside down. Paul Krugman, an economist at MIT, says that you can reduce the entire idea of the network economy down to the observation that "in the Network Economy, supply curves slope down instead of up and demand curves slope up instead of down." The more a resource is used, the more demand there is for it. A similar inversion happens on the supply side. Because of compounded learning, the more we create something, the easier it becomes to create more of it. The classic textbook graph is inverted. 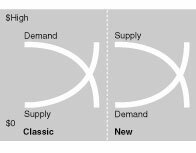 As the supply curve rockets upward exponentially and the demand curve plunges further, the new Supply/Demand Flip suggests the two curves will cross each other at lower and lower price points. We see this already as the prices of goods and services keep heading toward the free. But hidden between the curves is a momentous surprise. Supply and demand are no longer driven by resource scarcity and human desire. Now both are driven by one, single exploding force: technology.